This is one of my favourite photos. 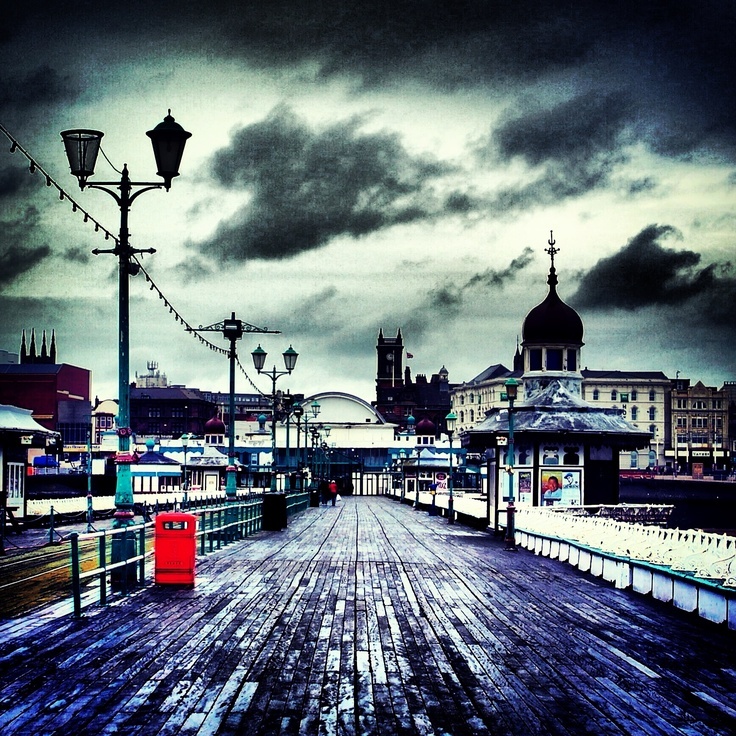 I took it on a wet and windy day in June 2013 on a trip to Blackpool. It was blowing a gale and walking down the North Pier wasn't a pleasant stroll, but a test of endurance. On the way back down the pier I took this picture. I double filtered it with Lo-fi. The thing I like about Lo-fi is the way it intensifies the colour. Whilst this picture's colour palette is predominantly blue, grey and black, I love how the red rubbish bin pops out of the picture. The rainwater on the wooden pier helps to reflect the light, which makes the picture brighter that it would normally be. I also like how some elements like the lamp posts, dome and church are almost in silhouette. The brooding darkness of the clouds completes this dramatic photo.